Yiddish Rhapsody presents a range of music including traditional folk, jazz, bolero, rock and musical theatre favourites. By turns poetic, tender, touching and funny the show is an incredible ode to life. Yiddish Rhapsody presents an eclectic, original and celebratory mix of instrumental music and songs. Unusually, the Sirba Octet is joined by a full symphony orchestra and Isabelle Georges, a major personality of musical theatre who sings in Yiddish. 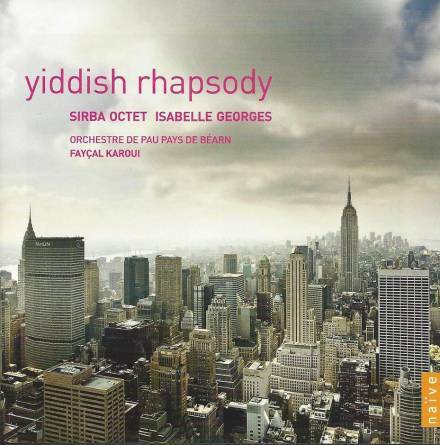 In 2009, at the request of the Orchestre de Pau – Pays de Béarn conducted by Faycal Karoui, Isabelle George and Richard Schmoucler created Yiddish Rhapsody to capture the essence of the legendary music cherished by Eastern European Jewish communities. The show was arranged by Cyrille Lehn. Yiddish Rhapsody’s originality comes from its staging. The Sirba Octet form a core chamber orchestra – a piano, two violins, a clarinet, a viola, a double bass, a cello and a cymbalum. Surrounding them is an orchestra of 48 musicians. At the front of the stage is Isabelle Georges singing and tap dancing! New and original arrangements of Yiddish melodies in a variety of styles form the backbone of the show. By turns poetic, tender, touching and funny, it is a wonderful ode to life. Sirba Octet, orchestra and Isabelle Georges perform at times separately at times as a full ensemble creating balance and contrasting musical moods. 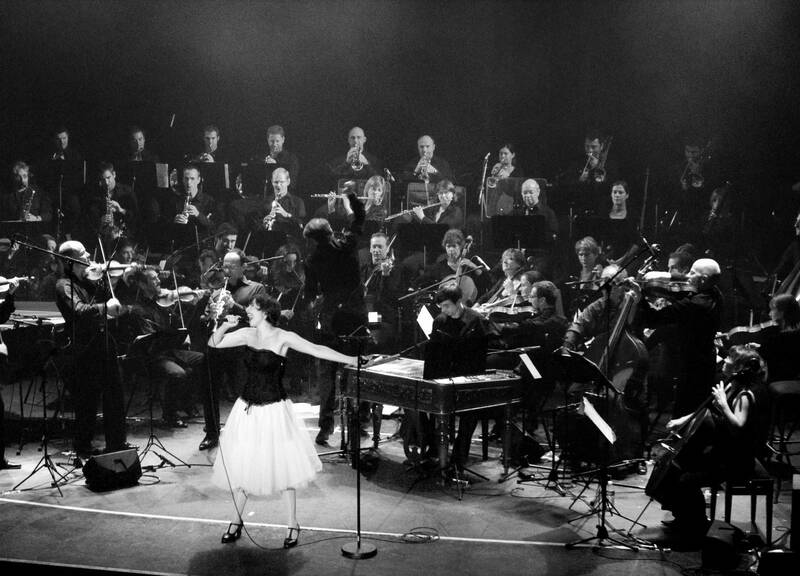 This one-off show offered a unifying and heart-felt range of music including the inspiring and profound Dona Dona, the impassioned Misirlou, popularised by Quentin Tarantino in Pulp Fiction, the nostalgia of Yingele nit veyn, the Sirtaki version of A Keshenever and energetic orchestral pieces Yiddish Charleston and Beltz. In combination with the skill and expertise of the Sirba Octet and Isabelle Georges, these traditional folk songs are truly refreshed and reformulated. L’Orchestre de Pau – Pays de Béarn conducted by Faycal Karoui at the Palais de Beaumont de Pau and at la Cigale in 2009.